Before I begin going over the details, I’ll tell you right now: the six-show run of this production was far too short. 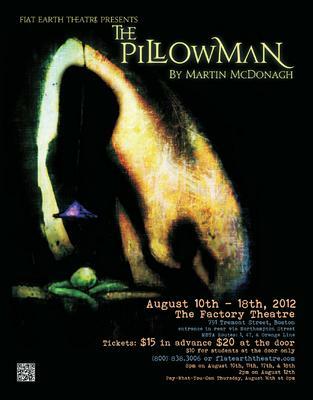 This was my first Flat Earth play, and if Pillowman is any indication of their work, it will be the first of many. I had high hopes going in, having heard good things about their previous production, Bug, and having seen Director Sarah Gazdowicz’s work before. Her punk version of Romeo and Juliet with IDS earned her a Best Director nomination from My Theater, with the show taking home Best Production in its division. My expectations were high and Pillowman delivered. This was my first experience with the text. A writer and his brother are accused of a string of murders when the writer’s stories are used to inspire crimes against local children. The style of speech at first perplexed me. It took me longer than I’m proud to admit to realize that struggle for expression and the effect of speech – a theme of the play – was exampled by Ariel (the bad cop) and Katurian’s (the accused writer) violent battles over the correctness of wording. They intensely argued over minutia such as “you can draw your own conclusions” and the permission implied by “you can”. Yet even in such a loaded text, the actors seemed perfectly comfortable. I sat close to the stage (there isn’t really a “far” from the stage in The Factory); the climactic ending of Act I (which was so well executed that I caught my breath even though I saw it coming) happened nearly in my lap. I wasn’t the only one physically affected; I could hear gasps and see hands raised to mouths. The polish of this show was icing on the very disturbing cake. The lights were subtle but tight, with a very cool fire effect achieved with light and sound. 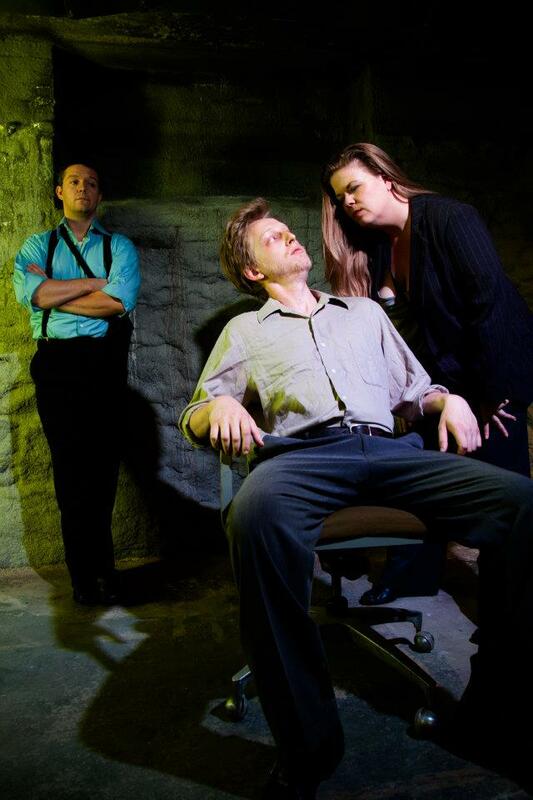 The light sounds of torture and the harsh metal of the set blended well with the business dress and police attire of Ariel and Tupolski, but seemed to exist in a different time period. It was difficult to pin down exactly where we were in time. This could have been a choice of the director, when the play happens has no effect on the importance of the story – it is timeless. This issue is more that Michal’s costume didn’t match his brother’s; Katurian’s old fashioned appearance highlighted Michal’s modernity. I was unable to tell if it was an oversight or a specific choice. In theory, it could have been a move intended to present Michal as child-like and charming but it just didn’t read for me. But by far, the coolest tech element was the shadow puppets. Two of Katurian’s stories were told directly to the audience. One is the important autobiographical piece “The Writer and His Brother” and the other I won’t spoil because of it’s relevance to the plot. While Katurian narrated, he opened the large sliding door that was the back wall of the set to reveal a screen lit from behind. Unseen puppeteers brought the stories to life as any child would imagine them – any psychotic child suffering from torture induced nightmares. I would devolve into another English major analysis here of why it works, but it would spoil the plot; suffice it to say, it’s brilliant. Although, none of this would have worked if Cameron Gosselin (Katurian) didn’t have a voice I could listen to for years, quite happily. His storytelling was melodic and chilling – and every time his stories took a dark turn I could feel my wonderment corrupt to horror. I vaguely remember Gosselin from Full Contact’s Titus Andronicus, but here he really shined. There was never a moment when I saw Gosselin instead of Katurian; I always believed him. My rapture was only broken when he engaged in shouting matches with James Bocock (Ariel). I personally hate shouting, even though I understand its uses in moderation. The power of yelling was well placed, but I would have preferred less volume. Juliet Bowler, as Tupoloski, only shouted once while being the most terrifying character on stage. Her kindness, born from practicality rather than mercy, enthralled me. Her comic timing is amazing and she has the best deadpan snark I’ve seen in a long time. I haven’t seen Bowler before, but I hope to see more of her. James Bocock I had seen before, in Argos Productions’ Murph, and I couldn’t have been happier to see him again. I wish we were best friends; I might have to stalk him now to find what shows he’s in so I don’t miss any. I both hated and loved Ariel; Bocock brought reality to an already complex character. He was my favorite person on stage, and I can’t say enough good things about him. Even his violence was brilliant. Though, a large part of the credit also goes to Gosselin, who pulled double duty as actor and violence designer. I can’t speak for his talent in Full Contact’s Titus, the violence there was a bit dodgy at times, but here it was tight. Punches happening at angles where I couldn’t miss the fact that they didn’t connect, were fast and intent enough that I was still shaken. The violence was in your face and the air oppressive with power, although the stifling atmosphere of The Factory helped in this sense. I feel awkard heaping so much praise, but I have to admit it was the best fight direction I have seen in a very long time. There was only one aspect, in quite a long play, which ate at me. I was able to rationalize not seeing Katurian’s face for the first 15-20 minutes due to the multi-sided audience, and it did not detract from my enjoyment (the only time I imagine myself saying that not seeing the lead actor’s face did not hurt my impression). What did detract, was Chris Chiampa’s performance of Michal. The other characters spoke extensively about his brain damage, but they (Gazdowicz and Chiampa) chose to portray this as manic. Or, manic is my closest guess for what I saw. Michal never came off as someone who needed protecting. He read as more socially stinted than mentally scarred. I’ll admit I don’t know what I wanted to see in the character, but it wasn’t that. It may have also been just an artifact of opening night jitters, but I have to judge the show I saw. That said, if Gazdowicz was going for manic, it gives the story an interesting ambiguity – in that case, what is the influence of dark stories in someone already disposed to episodes? Further discussion of this choice will have to happen elsewhere, I have a lot of thoughts on the subject, but it completely spoils the show. This brings me to my final point: I never felt as though the elements on stage were happenstance or oversight. Everything felt intentional. My immediate reaction (part of the critic mindset I suppose) was to pick out things that irked me, or stood out, but the longer I thought about them the more thematic justification I could find to support the choice I saw. I love a show that keeps me thinking; too many directors lower their standards in order to reach their audience. This show was one of the few that kept its audience reaching. Any quick assessment of the elements could be debated, and many could only be seen with real interrogation. This is what takes a show from being merely entertaining to being art – this is the effect of a truly masterful director. Every single aspect of this show was well-thought out and well executed. The entire team should be extremely proud of the production, and I sincerely hope to see more directing from Sarah Gazdowicz. This is one of the best shows I’ve seen all year. My vote for best supporting actress. It is my pleasure to vote for Juliet Bowler in the category of best supporting actress. My vote is for Juliet. She was wonderful. Best supporting actress. I vote for Juliet for best supporting actress. She is awesome!